Great review. I’m just new to blogging. Have heard a lot about this book on Instagram, but haven’t read it yet. Thanks. It’s probably proving to be a popular read for the month of April. I do hope you get a chance to try it one day. Isn’t it just! No wonder they were so taken with the prospect – such a breath of fresh air compared to the dark and dreary weather in London that day. I think you will love this book when you get a chance to source a copy. There’s definitely a touch of the Miss Pettigrew about it. I read this some years ago on Kindle, & recently bought a hard copy. Time for a re-read. Oh yes, do re-read it. I’m sure you’d get a lot out of it second time around. I read this book a couple of years ago and loved it. I’ve just bought “Elizabeth and her German Garden” by the same author, which I’m looking forward to reading soon. Isn’t it just the most wonderful book! It doesn’t surprise me to hear that you loved it as I recall your fondness for Miss Pettigrew – another charming read with a similar transformation at its heart. Elizabeth and her German Garden sounds like the natural follow-on read from Enchanted. I’ll be very interested to hear what you think of it. Just read and enjoyed, prompted me to pick up “Vera”. Oh my, how different but very, very good, I’d really recommend. Thanks, Poppy. I’m glad my review revived a few happy memories for you. It’s a delightful book, so warm and uplifting especially towards the end. You know it’s funny – I’ve ended up with two copies of this book, neither of which are Viragos! Nevertheless, it seemed appropriate to read it in April, even if I couldn’t claim to be participating in the Librarything/Virago group! Super review as always Jacqui. The characters sounds so well crafted. Sadly, Mellersh-Wilkins sounds like some people I know of. Too bad that such folks exist. It is really a nice thing when atmosphere and whether complement the book that one is reading. Thanks, Brian. What I liked about von Arnim’s approach was the care she took in fleshing out the details of Mrs Wilkins’ and Mrs Arbuthnot’s marriages and the very different challenges these two women faced. There must have been so many others like Lotty and Rose, left to wither away in rather restricted lives. I thought von Armin did a great job in capturing that. It’s what made the transformation in San Salvatore so joyful and liberating. Thanks for the share, much appreciated! An excellent account — many thanks. It’s one of those books that are forever on my “must get round to” list. Hm. I see it’s on Gutenberg, so I really have no excuse . . .
You’re very welcome. It’s a wonderful book, and it suited my mood just perfectly. There’s a film adaptation too, but I’m not sure I can bring myself to watch it. I have a very fixed impression of the characters in my mind, so I’m a bit concerned about doing anything that might disturb this! I’m hoping to read this soon so I haven’t read your review in depth – but I notice you compare it favourably to Miss Pettigrew, which is recommendation enough for me! Well, as you know I’ve now read and reviewed and I have to agree with you about how lovely the book was. And it was a joy to see the ladies blossoming in the wonderful setting! Wasn’t it just! I loved all the different transformations that took place, each woman changed in a slightly different and distinctive way. A most charming novel indeed. What a wonderful review. Once again, you have me yearning to read a work. Thank you!!! You are most welcome! I hope you get a chance to read it one day – it turned out to be such a treat. I do love these women writers from the early-mid 20th century, they’re more my cup of tea than many of the novelists writing today. I am with you there. I have recently read two Elizabeth Bowen works and have ordered A Game of Hide and Seek. I am so enjoying them!!!! Oh, I loved A Game a Hide and Seek. Elizabeth Taylor at her most subtle – I do hope you enjoy it. Bowen is marvellous too. I read The Hotel a couple of months ago and found it very intriguing. Which of hers have you been reading? So I see! Thanks for dropping by to comment on my piece about The Hotel. I’m not familiar with Friends or Relations, but I do have a couple of her other novels on the shelves: The Last September and The Heat of the Day. How alluring you make this sound! I’ll take that as a compliment! It really is the most charming book, like a ray of sunshine on a dark and miserable day. Marvellous! I think there’s a good chance you will like this a great deal. The writing is good, as is the attention to character. A classic that has stood the test of time. Fab review. I love this book so much. I recently bought a copy for my mum and was anxious that she enjoy it. She is currently reading it and seems to be enjoying it. Phew! 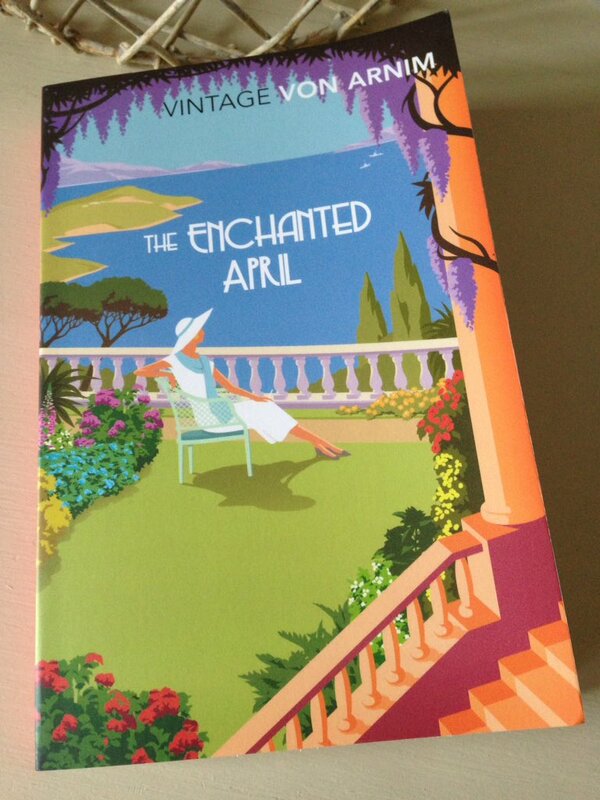 Your review makes me long to re-read The Enchanted April. Though I am likely to read another von Arnim after my current read. How lovely! I’m so glad your mum is enjoying it too. It really is the sort of book you want to press into the hands of friends and family, hoping they will feel just as evangelical about it as you do. Which von Arnim are you thinking of reading next? I know she’s the Librarything Virago author of the month, so I’m expecting to see a few reviews flying around. Ooh, I’ve never even heard of it! Looking forward to discovering more in due course. Lovely review, Jacqui. You mention a film adaptation in one of your replies – if it’s the one with Michael Kitchen and Joan Plowright you might consider watching it. I loved the book then saw the adaptation a few years later and loved that too. It’s beautifully done. Thanks, Susan. That’s good to hear. I’m still not sure if I can bring myself to watch it, but I’ll bear it in mind! 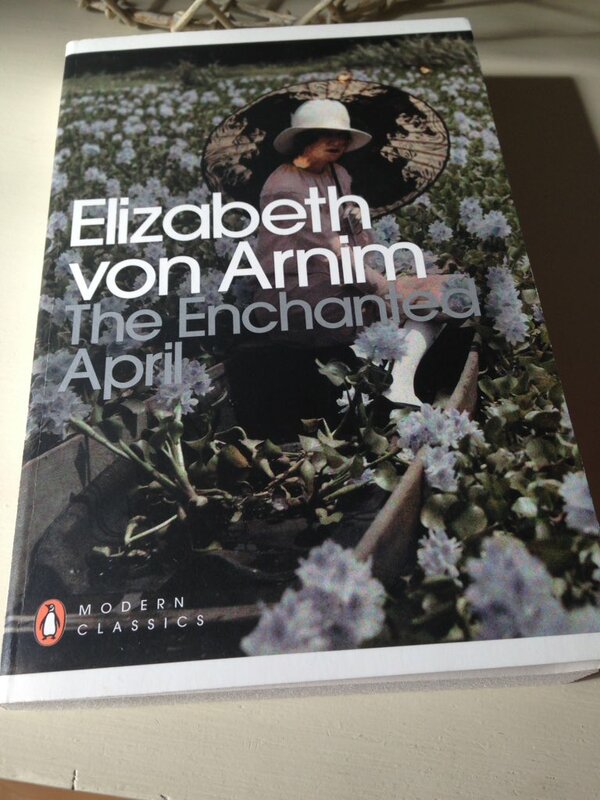 I loved this one too, I was introduced to Elizabeth von Arnim by a friend who gifted me Elisabeth and her German Garden, which is a wonderful novel and quite hilarious at times, and when I reviewed it, I recall many people mentioning The Enchanted April, which I think is more well known, but both are equally good in my opinion, so glad you picked an opportune moment to read it Jacqui! Not surprised its like to become an end of year favourite, it has much going for it! I remember your review of Elizabeth and her German Garden, Claire – a very evocative read if my memory serves me correctly. I have an old Virago copy tucked away somewhere, so maybe I should try to save it for a while. She writes so beautifully about the flowers and lush landscapes here. Great review Jacqui. I nearly started reading this the other day but instead chose one by Brian Moore. Thanks, Jonathan. I’ll be interested to see what you think of it whenever you get a chance. Some readers have found it a little too rose-tinted for their tastes, but I thought it was just wonderful. I wasn’t crazy about this one and found it a bit too Joan Plowright for my tastes. In some ways, I’m not surprised to hear that you didn’t take to this one, Guy. I had a feeling it might be too fairytale-like for your tastes. Yes not too surprising really. I liked this very much as well but didn’t care for Elizabeth and her German Garden. It’s a bit like a fairy tale. There are a few really lovely ‘Brits abroad’ books and thus us one of the loveliest. I was so disappointed when I read the next one and found it so different. That’s interesting. I think I may have mentioned this to you before, but I tried to read Elizabeth and her German Garden last year and didn’t get very far. I decided to put it aside in the end and pick up this one instead (plus it was on my list for the Classics Club, which gave me an additional incentive). I’ll try again at some point, maybe next year. You’re right about the ‘Brits abroad’ category, and this is a lovely example. Elizabeth Bowen’s The Hotel is another good one, albeit more mysterious and oblique. Lovely review Jacqui. It is indeed an enchanting book, one of my favourites and always a joy and pleasure to read. What a lovely weekend to read it too, just perfect. I’m sure I scrolled past references to the film which is definitely worth the watch. It has all the charm of the book, and a fantastic cast too. You’ve made me feel all nostalgic, maybe I’ll have to read this again. Old Mrs Fisher and her ‘stick’, so memorable. Thanks, Belinda. I’m so delighted to hear that you love this one too. Maybe it could tempt you back to the world of fiction one day? It’s such a wonderful comfort read. Mrs Fisher reminded me of a character from Elizabeth Taylor’s Mrs Palfrey at the Claremont, the arthritic Mrs Arbuthnot (not to be confused with Rose Arbuthnot here) who hobbles around the shared rooms with the aid of her stick. I can’t remember if you’ve read it, but there are some interesting parallels between the two. Perhaps I ought to have qualified my current fiction troubles as being centred around books I haven’t read before, I seem to have no difficulty in re-reading fiction books I have read before and enjoyed. This being one of them, which I know would slip easily down like a cool draught of refreshing water. I haven’t read Miss Palfrey but I am very tempted to read more Taylor and both Miss Palfrey and A Game of Hide and Seek are very tempting books. Ah. that makes a lot of sense. Mrs Palfrey is a treasure, a beautifully bittersweet story about friendship and ageing. I think you would enjoy it a great deal.